Vaiula team from Falevao took the Upolu Island Cup for international cricket held at Tuanaimato yesterday. Six teams participated in the three-day tournament which started on Tuesday. The teams are Vaiula – Falevao, Faleasiu, two teams from Tiavea Village called Tiavea and Oneone o Aleipata, Tauafiafi o Aana and Lalomauga. The team from Faleasiu took second place and in third place was Tiavea. The best batter award was received by Fereti Tapumanaia and Toetu Laau won best bowler. Despite the heavy rain, teams still put on a strong competition all aiming for the grand prize. Samoa International Cricket Association (S.I.C.A.) Senior Development Officer, Taitoe Kaisala said due to the rain some of their games were delayed. “This is the fourth time we have hosted this tournament and the key significance behind it is the fact that during the games we scout potential players that can join and represent our country in international cricket. “There will be players selected from each village based on their talent and performance. “It is our aim to further develop the sport of international cricket along with making it the number one sport in Samoa,” he said. 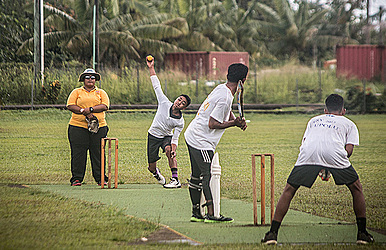 Taitoe said the development of cricket has also targeted the grassroots level meaning they had the chance to visit primary schools, even Sunday schools, church groups, and villages all around Upolu and Savaii all in the hope of promoting and growing the sport in the country.